The premiere of "Avengers: Endgame"; Zac Efron discusses portraying serial killer Ted Bundy. Rare chance: Spy Point Arena Lighthouse by the light of la luna. FULL MOONS... are about to get a lot of play in pop culture, what with autumn just ahead, and Halloween, and all of the werewolf-y, night-atmospheric films on the haunted horizon. But here's a widely known spoiler alert: Full moons don't wait for fall to work their luna-lovely charms. You can plan an evening picnic, or telescope party, or woodsy walk once a lunar cycle if the full moon is a major part of your life, or even find something just a tad more unusual and even memorable. Look to Point Arena Lighthouse, a gem of a structure that not only offers daytime walk-arounds but the occasional by-moonlight event, too. Since a lighthouse is all about lending illumination where it is needed, it feels right, and even poetic, to visit one of the Golden State's best-known examples when the light in the sky above is at its very brightest. If you've done some of California's lighthouses, but never after the sun has bid its ray-bright farewell for the day, call a Full Moon Tour at Point Arena Lighthouse a fresh and sometimes foggy dimension on a road-tripper classic. THE MENDOCINO COUNTY LANDMARK... traces its history back to 1870, so count on learning some of the facts and tales behind its multi-century run, a run that's led many a ship safely to shore. True, the 1906 San Francisco earthquake sent the lighthouse tumbling, but it was rebuilt, and today it beams brightly with its prism-tastic 1st Order Fresnel Lens. Spying the smokestackian tower by moonlight and hearing how it weathered the ages, with some starting over in the process, is a rare treat, but there are other treats to enjoy, from Champagne to juice and snacks. 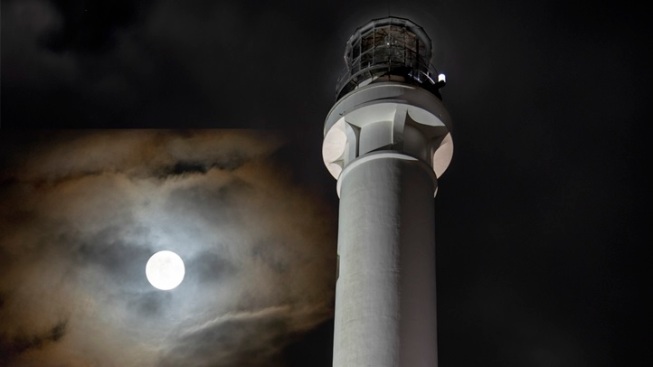 It's "the tallest lighthouse on the West Coast," and the chance to "climb the Tower at night," like lightkeepers have long done, is not to be missed. Nor is the chance to see your $30 ticket go to the upkeep and care of this important slice of coastal history.